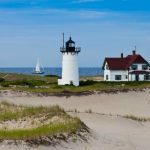 The Three Sisters of Nauset are a trio of historic lighthouses off Cable Road in Eastham, Massachusetts. Falling prey to coastal erosion and decay brought by time and poor maintenance, they fell into sea in 1890 and were replaced by wooden towers on brick foundations in 1892. In 1911, two of the three Sisters were decommissioned. One of them, known as the Beacon, was moved back from the shoreline and attached to the keeper’s house. It continued to operate for some time, but ultimately, the Beacon was replaced by the Nauset Light, a new steel tower in 1923, which operates to this day. 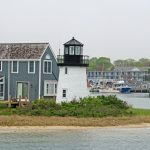 The Nauset Light Preservation Society operates, maintains and interprets the site, having signed a partnership agreement with the National Park Service since 2004. Visitors can currently tour the site on Sundays, from May to late October and also on Wednesdays during July and August. In 1836, concerned Eastham residents petitioned the Boston Marine Society to recommend to the United States Congress the construction of the Nauset Lights, because of the many shipwrecks regularly occurring off shore. 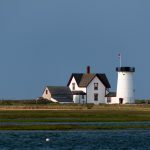 In response, the Congress granted $10.000 to build suitable lighthouses in Eastham, in order to provide a light halfway along the eastern coast of Cape Cod. The contract was awarded to Winslow Lewis, and soon enough three fifteen feet high masonry towers were built, in a straight line along the crest of the cliffs, painted white but with black lantern decks. They earned their nickname, the “Three Sisters” because when looked at from afar, they looked like black hatted women dressed in white. For roughly fifty five years, the Sister’s did their job admirably, helping mariners and ships avoid shipwreck. As years passed, though, thee three Lights were getting dangerously close to the cliff’s edge. At the time, moving the three of them intact was deemed impossible and thus, it was decided they should be replaced. Three new and slightly larger wooden lighthouses, shaped to resemble the prototypes were raised thirty feet west of the original sites. They were heavily influenced by the first trio of towers, bearing identical markings and even using the lenses from the originals. The old towers were allowed to slowly fall into the Atlantic. 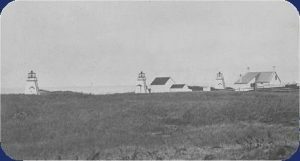 By 1911, the situation was getting worse and worse at the Nauset Light Station. 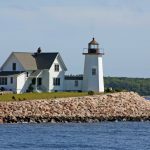 Maintaining the three Lights was getting increasingly costly, and the erosion of the Nauset Cliffs would continue relentlessly. The northernmost Light had moved to only eight feet away from the cliff. It was then decided that the Lights had to be moved back again. Advances in technology allowed the moving of the center tower away from the cliff’s edge attached to the oil house. The other two towers Sisters were promptly set aside and decommissioned until a decision could be reached about their future. Meanwhile, the central tower up took the nickname the Beacon. It stood as the only remaining operating Light, with a triple flash every ten seconds, in honor of her other two sisters that were put away. The Beacon served her purpose for years, but inevitably, she soon fell into disrepair. In 1923, the third, last Sister was put away. 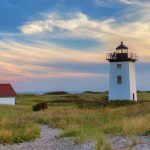 It was replaced by an old tower, constructed in 1877 as one of the two towers in Chatham, which later came to be known as the Nauset Light, the last in a long lineage of Lights. 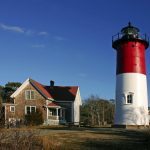 The Nauset Light was initially all white, but in the 40s, its top section was painted red. The Light has been automated, its keeper’s house sold since 1955. 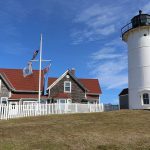 As the previous Lights before it, the Nauset Light too eventually fell prey to coastal erosion, being less than fifty feet away from the cliff on which it stood by the early 90s. 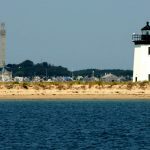 After the public outrage following its proposed decommission by the Coast Guard in 1993, the Nauset Light Preservation Society was formed. The tower and its oil house were relocated further away from the cliff’s edge, and by 1997, the Nauset Light was back in working condition. 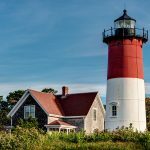 To this day, the Nauset Light still stands under the protection and maintenance of the Nauset Light Preservation Society. What happened to the Three Sisters? After the first two of the Sisters, the Northern and Southern lighthouses, were decommissioned, they were sold at a public auction for the measly prize of $3.50. Their new owner, the Cummings family, first moved them to a site near the old French Cable station, before making some repairs. 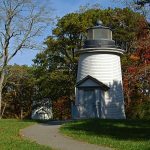 In 1918, having both their lanterns removed, they were moved and incorporated to a summer cottage along Cable Road, adjoined with a room which came to be known as the Twin Lights Cottage. The Twin Lights Cottage was subsequently used as a summer cottage and dance studio, until the Sisters were finally sold to the National Park Service in 1965. After the Beacon finally got replaced by the Nauset Light, it eventually got sold to Albert Hall, getting turned into a cottage until the National Park Service bought it in 1975 in order to finally reunite the Three Sisters together. Following their listing on the National Register of Historic Places, the three old towers were renovated to their current state, very close to their replacement, positioned in accordance with their original orientation. To this day they still stand, with regular tours taking place on them by the National Seashore Staff. Turn right onto Nauset Road – third traffic light after the Orleans/Eastham rotary. Follow the Nauset Road and turn left to Cable Road, continuing to its end. The three Sisters will be standing in a clearing on the left of the Cable Road. If you somehow reach Ocean View drive and the Nauset Light without seeing them, you’ve gone too far and should backtrack. The Highland Light in Truro had one steady burning light. The Chatham Light had two towers, each burning a steady light. because of the many shipwrecks that were occurring offshore. 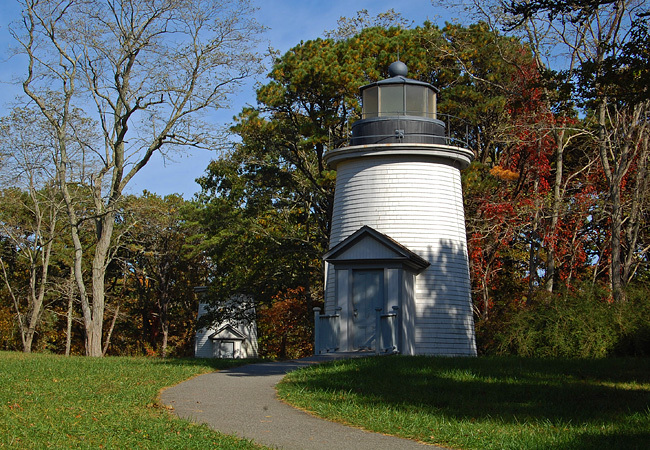 In 1837, Congress appropriated the money to build a light in Eastham. to mark the dangerous Nauset sand bars off of Eastham. in a clearing near the Nauset Light. Travel along Route 6 heading East towards Provincetown. onto Cable Road. Go to the end of Cable Road. reach Ocean View Drive, and the Nauset Light, you have gone too far.